US Navy/Mass Comm. 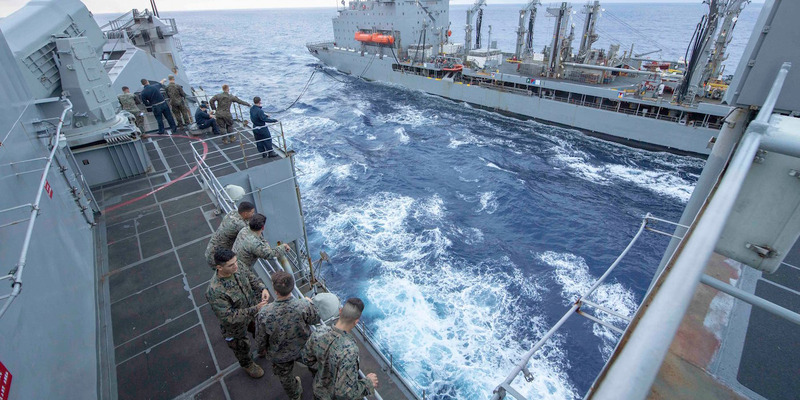 Specialist 3rd Class Colbey LivingstonSailors and Marines on the USS Gunston Hall observe an underway replenishment with the fleet-replenishment oiler USNS John Lethall, October 6, 2018. NATO’s largest exercise in years, Trident Juncture, will start on October 25. Tens of thousands of troops and their gear are converging on Norway and the North Atlantic. Some US soldiers and US ships have already had some mishaps. Tens of thousands of NATO troops have converged on Norway for Trident Juncture, the alliance’s largest military exercise in nearly two decades. The exercise officially starts on October 25, but the arrival of thousands of troops and their equipment in the harsh environs of the North Atlantic and Scandinavia hasn’t gone totally smoothly. On Tuesday, four US soldiers were injured in a roadway accident as they delivered cargo to Kongens Gruve, Norway, in support of the exercise. “The accident occurred when three vehicles collided and a fourth vehicle slid off the pavement and overturned while trying to avoid the three vehicles that had collided,” the US Joint Information Center said, according to Reuters. US Army/1st Lt. Ellen BraboA US Army Stryker vehicle completes an uncontested wet-gap crossing near Chełmno, Poland, June 2, 2018. One of the soldiers was released shortly after being hospitalized, and as of late Tuesday the three others were in stable condition but still under observation, according to the information center. The troops and their trucks were assigned to the Army’s 51st Composite Truck Company, stationed in Baumholder, Germany. US ships taking part have also encountered trouble. The amphibious dock landing ship USS Gunston Hall, part of a group of ships carrying a Marine Corps contingent to the exercise, returned to port in Reykjavik, Iceland, on Monday after heavy seas caused damage to the ship and injuries to its sailors. The US 6th Fleet, which oversees operations in the Atlantic around Europe, said the ship’s well deck and several of the landing craft aboard it were damaged. The Gunston Hall returned to port for a damage assessment, though there was no timetable for its completion, the fleet said. The sailors who were injured received medical treatment and returned to duty. US Navy/Mass Comm. 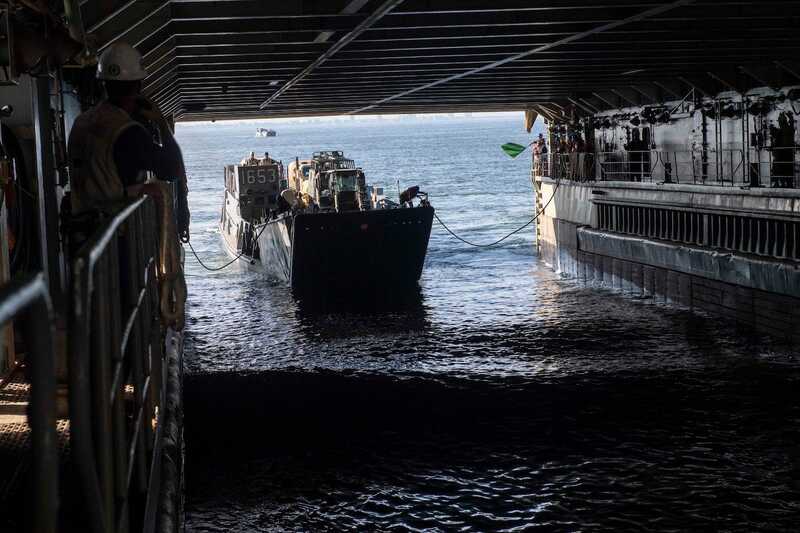 Specialist 3rd Class Colbey LivingstonA landing craft enters the well deck of the USS Gunston Hall to embark for Trident Juncture 2018, October 3, 2018. 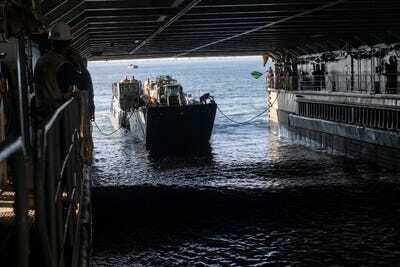 The amphibious transport dock ship USS New York, also on hand for the exercise, also returned to Reykjavik “as a safe haven from the seas until further notice,” the fleet said. The Gunston Hall and the New York were part of a group led by the amphibious assault ship US Iwo Jima that left the US earlier this month, carrying some 4,000 sailors and Marines. That group carried out a simulated air assault in Iceland last week and has been doing cold-weather training in preparation for Trident Juncture. 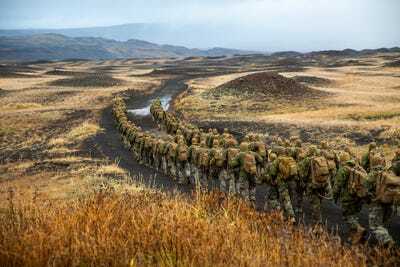 US Marine CorpsUS Marines with the 24th Marine Expeditionary Unit hike to a cold-weather training site in Iceland, October 19, 2018. It’s not clear if the absence of the Gunston Hall and the New York will affect the exercise, the 6th Fleet spokesman told Navy Times. Trident Juncture will include some 50,000 soldiers, sailors, marines, and other personnel from each of NATO’s 29 members as well as Sweden and Finland. The drills will be spread across Scandinavia and the waters and airspace of the Baltic Sea and the North Atlantic. Massing men and machines for such exercises rarely goes off without problems. 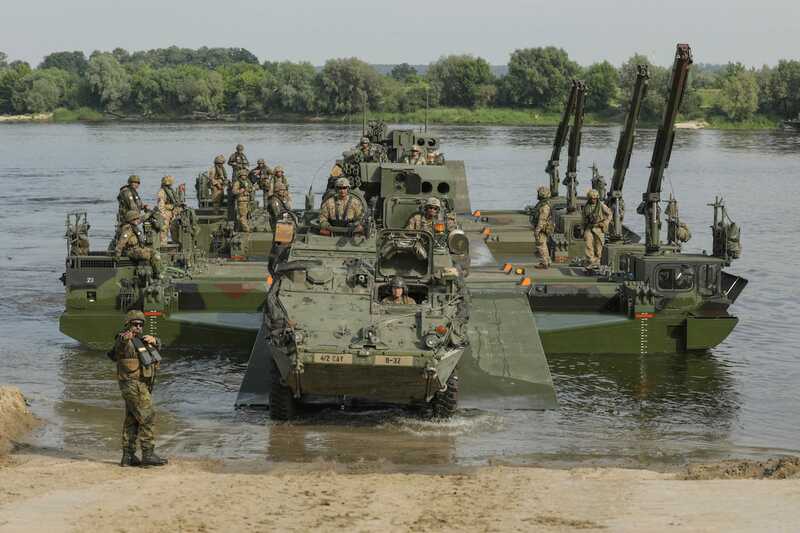 In June, as some 18,000 personnel from 18 countries took part in the Saber Strike 18 exercise in Eastern Europe, four US Army Stryker armoured vehicles collided during a road march in southern Lithuania. Fifteen soldiers were taken to a local hospital, 10 of whom were held for overnight observation, but all returned to duty.